Whether you’re an owner of a 6-unit or a property management company with thousands of units, a reliable multifamily laundry equipment provider is crucial to your properties’ success. Purchase, Rental, Or Revenue Sharing? There are a few different options to consider for your properties’ multifamily laundry equipment. With this option, your property will purchase the commercial laundry equipment from a given distributor. Since your property owns the equipment, you will be entitled to collect and deposit all of the revenue generated. However, since these pieces are commercial grade, you will also need to adequately service the machines in a timely manner. The longer the machines are down, the more revenue your property will miss out on. It’s typically best practice to stock common parts like door seals, water valves, drain valves, and water hoses in a maintenance room for quick repairs. As the equipment ages, the expected service and parts related expense will also grow. Typically, property managers will keep a portion of the collected revenue to offset the future repairs and new equipment purchases. Typical laundry service companies like Advantage Equipment are able to service an account within one business day of when the call is placed. If your property does not want the added headache of continual maintenance, then renting may be a good option. In this agreement, a vendor (like Advantage Equipment) will install the necessary equipment in your laundry facility. In exchange for a monthly payment, you will receive all parts, maintenance, and service included for free. Your property will also be entitled to collect and keep all of the revenue generated. The term for this agreement can range anywhere from five to ten years, and it typically moves to a month to month agreement at the expiration of the term. One of the most popular options in the multi-housing industry is a revenue sharing program. In this program, a vendor will install commercial washers, commercial dryers, and the necessary payment system at no expense to the property. 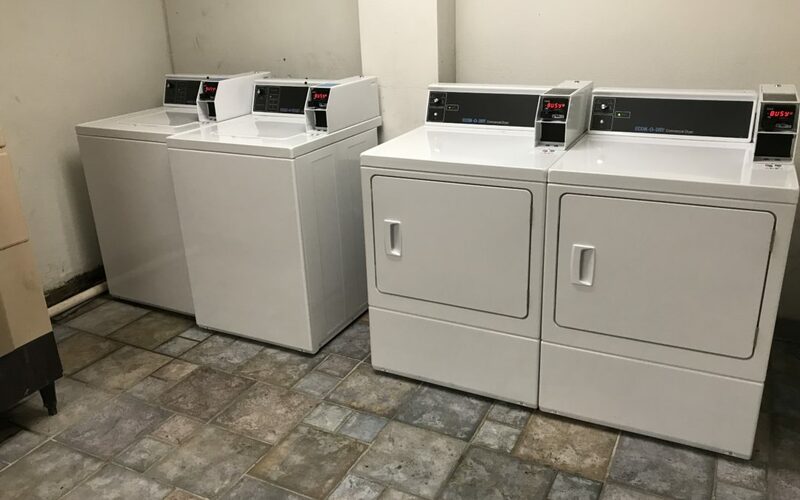 In essence, the vendor is leasing the laundry room, and in exchange, they’re paying the property a percentage of the monthly revenue generated. The property is only responsible for paying the utilities, keeping the room in a clean order, and notifying the vendor of equipment issues (among other things). This option works best for properties who do not want to deal with the maintenance and expense that commercial laundry equipment entails. Instead of paying money monthly for the equipment, you will receive additional revenue without the added expense that commercial laundry equipment brings. 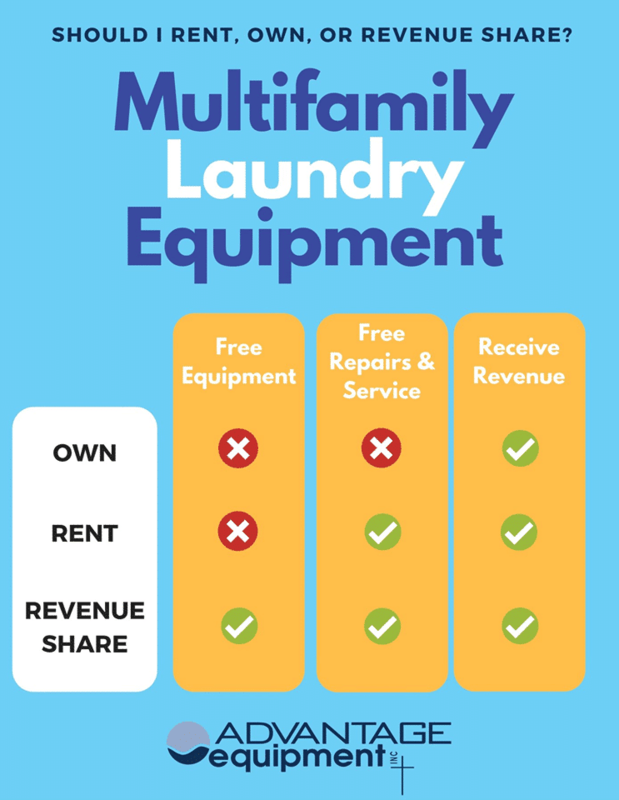 If you’re considering your options for multifamily laundry equipment, consider this info graphic for guidance. After incorporating in 1996, we have quickly established ourselves as a leader in commercial laundry equipment and related services. Moreover, we’ve been partnering with the multi housing industry to provide outstanding revenue sharing programs, equipment, and service for properties. As an active member in the Northern Ohio Apartment Association as a President’s Circle Member, our overall goal is to provide timely service, exceptionally efficient equipment, and state-of-the-art payment systems for our clients. Learn more about how we can help grow your multifamily laundry operation today!